I have some not so fond memories growing up with ill-conceived succotash. Ill-conceived in that it was often thrown together in haste with frozen or canned vegetables and called dinner. My mother was not remotely the best cook, and I gained most of my culinary knowledge from my grandmother and watching Julia Child masterfully make wonderfully complicated dishes and proclaiming that there are never any mistakes when cooking, unless you forget to season. I suppose growing up with daily dinners lacking in luster was part of my catalyst into gourmet cooking. Over the years, Victoria has reintroduced me to ingredients and foods, that conjure the undesirable childhood memories, but changed my view and reminded me of the single most important requirement in good cooking – fresh ingredients. For this dish, the freshness of husked corn offered sweet and tender texture balanced with the faro and accented with fresh thyme. 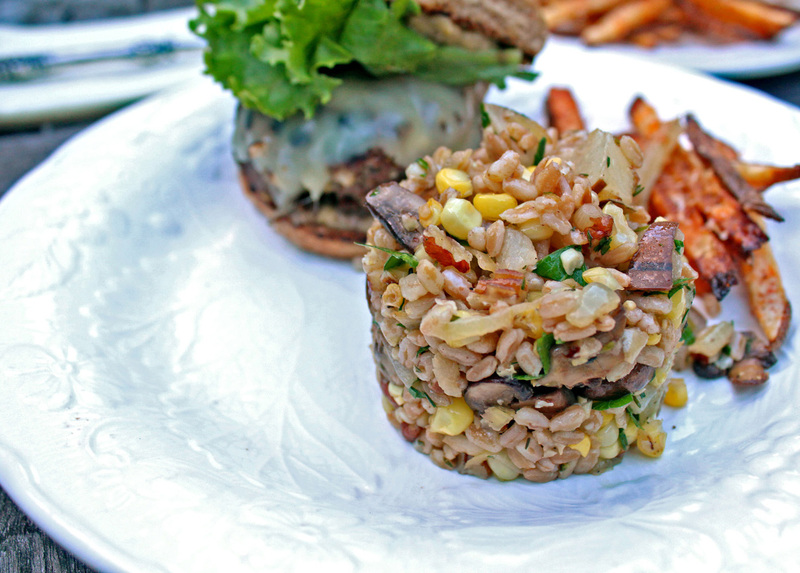 Seasoned simply, this recipe made the perfect side dish for our beefy burger dinner sitting outside as we enjoy the slow end of summer and welcome the crisp cool fall air. 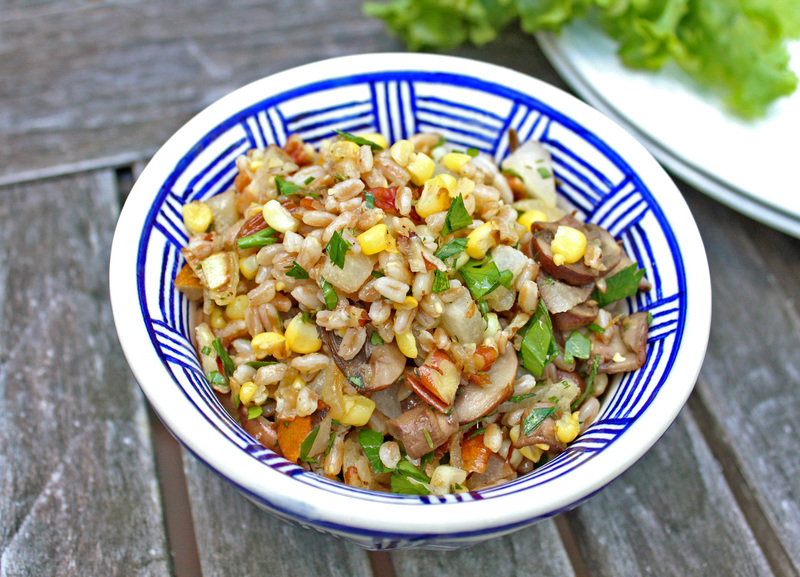 Soak farro in water for 15 minutes then drain. In a sauce pan, bring farro and 3 cups of water to boil, then reduce heat to medium, add garlic clove and 1 tablespoon olive oil, and gently boil for 15 minutes. Remove from heat and set aside. On a cutting board, carefully cut the kernels form corncobs, and set aside. Toast pecans in oven at 300°F for 5 minutes, then remove from heat and let cool before chopping. In a large skillet over medium heat, sauté onion, garlic, and corn with 1 tablespoon of olive oil for 15 minutes. Add mushrooms and thyme. Cook for 15 minutes more stirring occasionally. Season with salt and pepper. Remove from heat and stir in pecans, parsley, and cider vinegar. Yes, fresh purple pinot peppers we grew in our garden and roasted to make this divine puree spread. In a bowl, combine all ingredients. Form meat mixture into large patties and set aside. Drizzle olive oil over burgers and grill to desired doneness. Toast buns and serve with pepper puree and lettuce. Remove from oven, and let cool, then remove seeds from each pepper. In food processor, puree peppers. Add remaining ingredients, season with salt and pepper, and pulse to combine. This entry was posted in Cooking, Fall, Sides, Summer by cfaust. Bookmark the permalink.